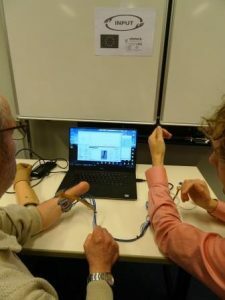 At March 18th 2017, a patient information day was organized by the rehabilitation team of the University Medical Center Groningen in the Netherlands. Over 100 persons with an upper limb amputation or a congenital reduction deficiency and their family attended the meeting. The day started with a mini-symposium about new developments and new treatments in upper limb prosthetics. Research activities, such as the application of serious gaming to learn pattern recognition control as developed in the INPUT project, were highlighted during the mini-symposium. Furthermore, pattern recognition could be tested by the participants in three consecutive workshops. As such, many participants got an idea what pattern recognition control could mean for them in the future. Next to the research workshops, several manufacturers of upper limb prosthesis products, amongst others Otto Bock, gave interesting workshops to show the functional options of their products. Furthermore, the original Cybathlon trail was available and could be tried by prosthesis wearers. Of course, meeting and talking to companion amputees was also an important aspect of this day. Participants regarded the day to be very informative and most pleasant.